ive compiled a few thoughts on what worked for us travelling abroad with Max a few weeks ago. i was quite anxious about the entire trip as we had never been on a plane before and didn't know how Max would react. i perused through a number of websites, did my research, and had a successful vacation (successful because it actually felt like a vacation instead of different country same routine, y'know?)! 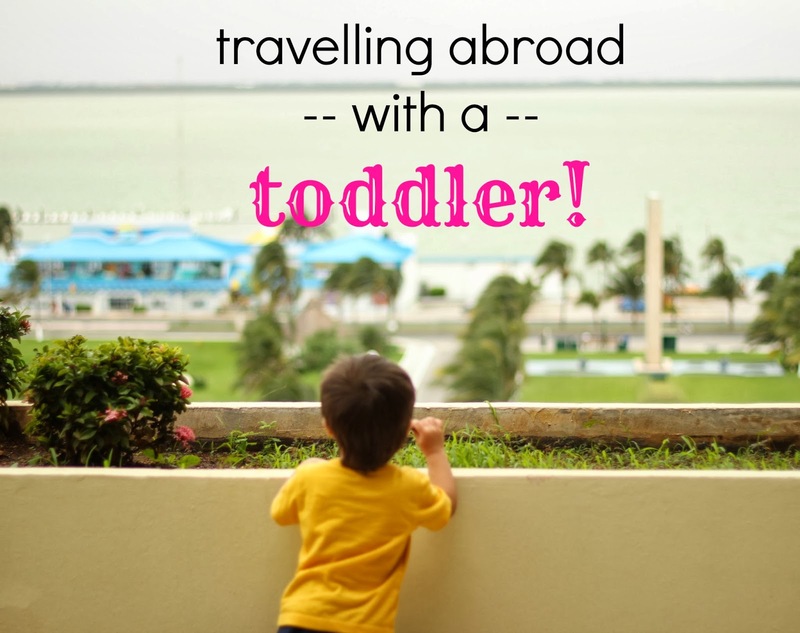 even though we are by no means seasoned experts i hope these tips can help someone travelling with a little one(s)! before we booked our trip i scoured the internet looking for comparable offers aka deals. i didn't know anything about the airline and booked the deal based on schedule convenience. when we checked in at the airport, they saw us with a toddler and had us bypass the long check in line up and instead go to the "family line up." this allowed us to get things going quicker without having to deal with an ansy child getting bored of sitting in the luggage cart and running around in a busy terminal, and have extra time for incidentals before boarding -like waiting for the kid to have a morning poop so diapers will be clean for the flight. at boarding time, families with littles boarded first which i thought was a great idea as we were able to sit not only right away but bypass large people hauling their large carry-ons that were swinging to and fro- essentially we bypassed possible unintentional injury from suitcases. our flight also fed us a meal with special meals for kids. lastly, the flight attendants gave us seat shuffling ideas so parents can have their kids sit on empty seats to nap (or just in general) and if anything, have families sit together on board. i saw a lot of advice on choosing a red eye flight with kids, but i knew that that wouldn't work for us. i instead chose a very early morning flight (depart 630am) so Max can fit in a nap sometime during the trip. the day before, i sacrificed Max's afternoon nap so we could go to bed at 7pm (as in lights off sleep now!). we woke him up around 330am and treated it like a regular day. all bags were packed and ready, and the only thing we needed to worry about was breakfast and if any fights were to be had to get Max dressed (he always puts up a fight to get dressed!). by 630am we were off, and he was exhausted by 945am that he slept for 2.5 hours without incident on the plane. by the time we got off, he was rested, fed, diaper changed, and had an overall positive plane experience. 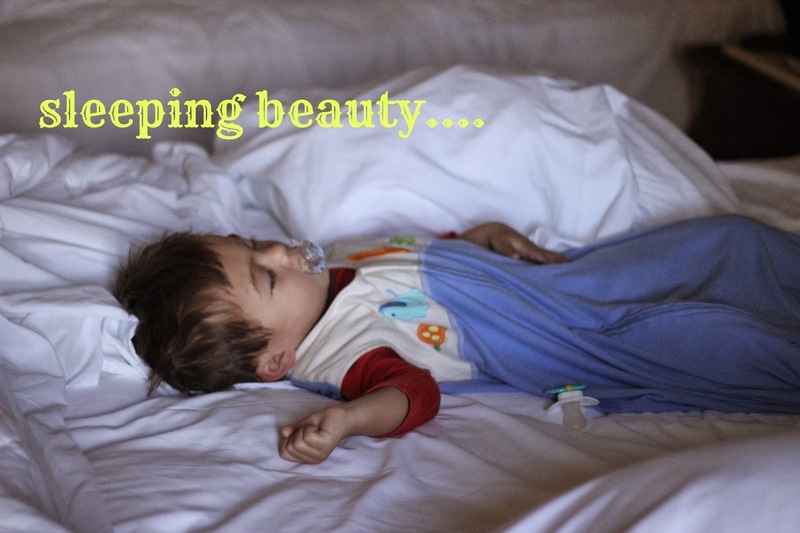 that nap lasted him until bedtime that night (we went to bed sort of early because we were exhausted too). the next day, we carried on and had nap schedules in between Vancouver and Mexico time. for our first trip abroad we were somewhat over packers. in our carry on backpacks we brought costco-ish sized snacks for the week; granola bars, goldfish, and raisins. we also brought a few crayons, books, trucks and cars (hot wheel sized) and about 7 diapers between the two of us. a rational person would put this in their check in luggage but i was scared that our luggage would get lost and we'd be left with a diaper less hungry child! so we lugged it in our backpacks, and although our luggage arrived safely the hauling was worth it for my peace of mind. during our plane ride when Max refused the plane food, out came some fresh fruit (they let you through with fruit when with a baby) and his fav snacks. when he got bored we found some space near the plane exit to play with his cars, and he bridged a friendship with other kids by having a toy to offer. i also read in many blogs to bring new toys for the kids, but in Max's case we were more successful with the toys we knew he liked playing with and would carry on his usual way with the comforts of home. we did bring lollipops as the 1 new thing we would try at a point of desperation, we ended up giving some away to other kids who's plane ride experience wasn't going as smoothly as ours. i had researched the possibility of ordering diapers online and having them sent to our hotel but the paranoid person in me let that idea go and brought about 50+ diapers for the trip. our carry on stash was extremely helpful for Max's large poop in Mexico's 2 hour immigration line up. it was hot, it was crowded, Max was having a tantrum because he had a poop and was feeling gross- so i layed him down and changed him on the spot. it was smelly for all travellers involved but the kid was clean and happy. the kirkland wipes lasted us from beginning until the end with plenty to spare...and it was with us all.the.time. i brought a huge pack of diapers as i wasn't sure how Max's GI system would react to the food and water. he had just had a bout of gastroenteritis (think diarrhea) a week prior and thus a diarrhea experience was fresh on my mind. i also didn't want to pay $40 for a few days worth of diapers at the hotel pharmacy. even though the diapers did take up a large amount of room at the beginning, we had more luggage room at the end as we used up supply. sans child we did whatever and whenever. with Max we knew that we had to take him into account if we wanted to enjoy this trip. we chose a resort that was very kid friendly and Max had a ball the entire time. when the weather was not so paradise-like, the hotel had an indoor play area where we spent many hours. lots of toys, lots of kids, and we weren't responsible for cleaning up the disaster (but we did put away our mess). as gene and i were ocean and sand lovers, we thought naturally Max would be the same but we were wrong. when it was sunny out, although we wanted to tan together and relax, Max wanted to go to the pool. we shared responsibility by taking turns wading with Max while the other was soaking it up and drinking at the beach. for the majority of the time it was a blast and Max was having a ball- happy baby = happy wife = happy life! when it was nap time, we all retreated to the palapa, Max slept under the shade and cool breeze and husband and i were able to be on the beach at the same time soaking up paradise. we really enjoyed our trip with Max and were even planning our next all inclusive vacation! it's nice to spend some alone time with Gene but i had an entirely different and much more enjoyable time as a family. so many memories this time around and i can't wait for next time with an older, potty trained, little boy! Those are really good tips - I'm going to bookmark this page for our summer trips! Our small one will be just over 2 but I have no idea how he'll react to travel! awesome! we were in the same boat and i was pleasantly surprised (and relieved) that it all went well. safe and happy travels to you!